What is this lizard? Salamanders in the desert? It reminds me more of a salamander (no scales) and I definitely haven’t seen one of those before. That green color on the head is so strange and where is the tail? Update: Others agree that it’s a salamander, but nobody can tell me how it would get to our place. There are no springs, creeks or lakes anywhere around here. ← Enjoy your coffee — it’s GOOD for you! 4 Responses to What is this lizard? Salamanders in the desert? 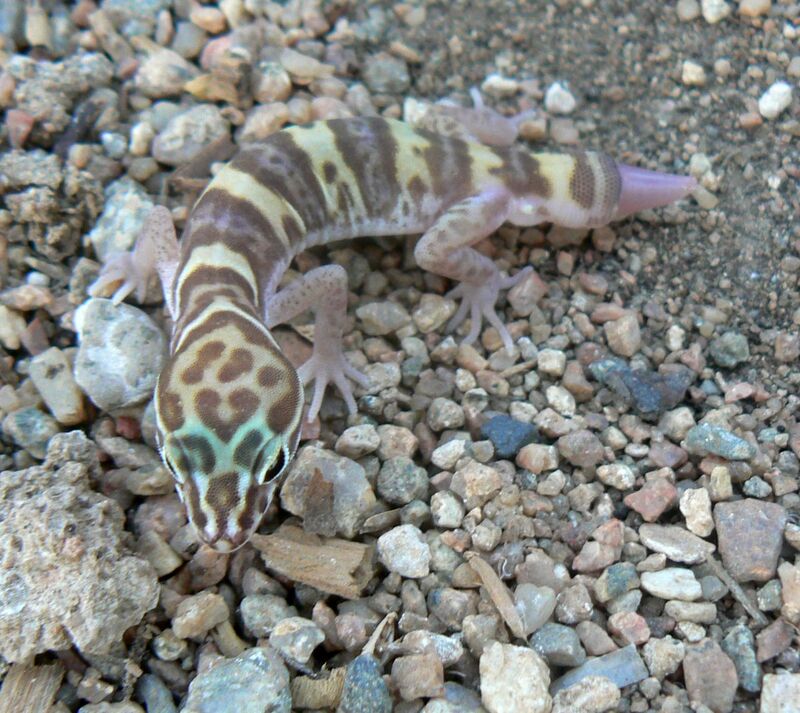 This is a Western banded Gecko! We have them here in Parker Arizona. They can lose their tails like most lizards with a replacement stump as yours has..i think they grow back. They live all over the desert.. like many reptiles…up to 5000 foot elevation…don’t need to be near a body of water. i enjoy your site here ..have been researching whether Dolan springs area is non-toxic enough for an evironmental sensitive person. Regarding environmental sensitivity, what exactly are you sensitive too? There are not a whole lot of cell towers and high voltage lines around here, but if you’re sensitive to dust, that would be a problem! I was in Dolan today for the parade and afterwards we stopped at the orchard and I sure wish I had the money to buy it! 4 acres with fruit trees and a nice 1,200 sqft late 90s mobile and a garage in a very private setting with two wells — I drool every time! Please let me know what you’re looking for (or not) and I’ll be glad to give you my 2 cents. Oh, i Missed the fun in Dolan Springs…Drat! Glad i could help on the Gecko ID. We had a run of Baby ones here a couple years back.. they may look slow but Man those little dudes can skittle on out of there FAST! There seems to be a time they are slower though..like most reptiles it has something to do with body temps, if i remember rightly. i’ve caught them in the cool of the morning while rearanging the rock & driftwood gardens…they like Termites! We’ve spotted the orchard on Zillow, drool worthy it is!) Just a whole lot Out of our budget though. My hubby is a displaced Pastor working in a Hardware store (that he loves) .. we have been saving what we can but with health issues and no insurance it’s been 3 steps forward 2 back; Making headway though. We moved here for my health. i have improved, but our present situation isn’t optimum. We’re looking for a little place with breathing room…low down, owner carry. Dust is no problem .. nor pollens as long as there are no crop dusting or bug sprays…Chem’s are a ‘Big-huge’ problem. As are fuel fumes from trains, planes & automobiles. i haven’t had problems with Cell towers or transmission lines… but we are very interested in going Solar/off grid. …. i know, somebodys pet project, i just fail to appreciate thier visual aesthetic. Thanks for the offer of your “2 cents”… it’s worth much more actually. We’ve been listening to KVIP on the radio for over a decade…and always listen for the Meadview weather report first thing in the morning. After traveling all over the U.S. it’s kinda funny to be looking at a possible move up that way. Either way… i enjoy your writtings and look forward to visiting the area before too long …perhaps we’ll meet then? Thanks again and Keep up the Great information… we appreciate it. I’d love to get together with you when you come to the area! There’s no crop dusting around here (no crops to dust) and we don’t have a whole lot of fuel fumes, except from the buses on Pierce Ferry, going up to the Skywalk. Speaking of weather reports, I bet you didn’t hear that it FROZE a couple nights ago. It got down to 30 F in our hoophouse, but must have been colder in our lower garden because even the tomatoes and peppers froze. The squash and zucchini are all frozen except for one that was sheltered by the sorghum. Our upper garden is fine, zucchini, tomatoes and all … Just goes to show that the coldest air really is at the bottom. We’re at 4000 ft here, a little higher than Meadview and always a few degrees cooler. That’s NICE in summer, I guess you can’t win them all! So anyway, please let me know when you come up here.